The new “Blackout” Marlin is a whole lot of hand-wound sophistication in a $200 package. Last year, Timex released a little watch that made a big splash. The Marlin was a throwback in all the right ways, with a hand-wound mechanical movement and a 34mm diameter that recalled the very best of mid-century design. And at just $200 for a timepiece that we declared, at the time, looked like a million bucks, it’s really no surprise that it sold out entirely, leaving more than a few broken hearts and empty wrists out there. Well if you missed out the first time—or you just want another version of the modern classic—you’re in luck. 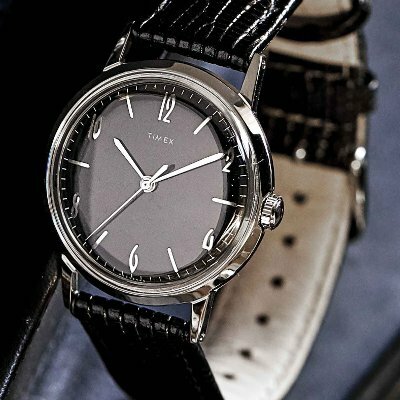 Timex just teamed up with Todd Snyder to create a limited-edition “Blackout” version of the Marlin, with a black sunray dial and a croc-embossed leather strap. It’s the sleek, black-tie ready version of the timepiece—and it still rings in at a supremely affordable $200. The Timex + Todd Snyder Marlin “Blackout” drops today exclusively on Todd Snyder’s site. It’ll also be available later this year at the New York-based designer’s flagship store on Madison Square Park. Our advice? Don’t wait. Get one now, wear it early, wear it often—and let the compliments roll in all summer long.